Sara Ali Khan will be his costar! Varun Dhawan's next film will be launched on his birthday, April 24. A revamped Coolie No 1 will be directed by his dad David Dhawan. The entire Dhawan clan, including Varun's girlfriend Natasha, is expected to appear on stage on the occasion. The original Coolie No 1 -- Govinda -- is expected at the launch, but considering how moody Govinda appears about his relationship with David, it remains to be seen if he shows up. Varun will play a trendy coolie, unlike the 1995 original. "The red coolie's uniform that Amitabh Bachchan and Govinda wore in Coolie and Coolie No 1 are a thing of the past," a source close to the project tells Subhash K Jha. "If you see the coolies at Matunga station or Mumbai Central, they are dressed in jeans and t-shirts. Varun will wear the same." Also, his character won't spend much time at the railway station. 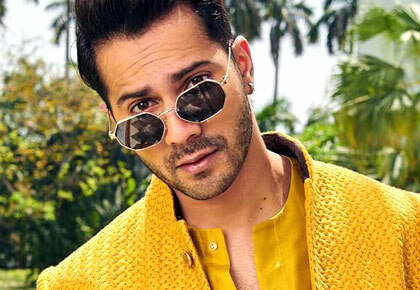 "Once it is established what Varun's profession is, the film will quickly move to the comedy and drama outside the railway station," adds the source. Sara Ali Khan will play a character inspired by Karisma Kapoor from the original. "She will play a feisty and outgoing girl, just like Karisma," we're told. Two of Anand-Milind's chartbusters from the original will be recreated for the remake: Husn Hai Suhana and Main To Raste Se Ja Raha Tha. "We plan to keep the original songs as sung by Abhijeet, Chandana Dixit as well as Kumar Sanu-Alka Yagnik. Why should David re-mix those hits when they are popular to this day?" asks the source.